Christ is King Baptist Church now meets at 6142 South Salina Street in Syracuse (Nedrow). We are in the plaza across the street from the new Colonial Laundromat and OIP Pizza. 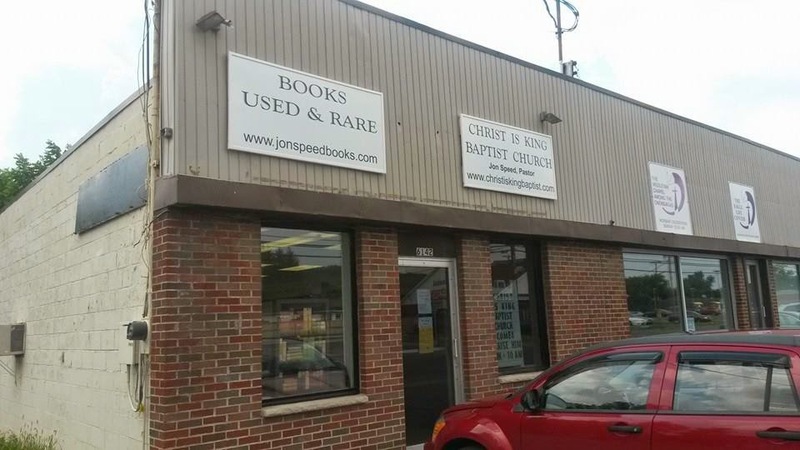 We meet in the used book store ("Used & Rare Books" signage for Jon Speed: The Book Scout). We are excited about our new location since it provides us with space on a busy street with lots of foot traffic. In other words, it's a great opportunity for ministry to the Valley neighborhood of Syracuse and Nedrow. Please come join us as we worship King Jesus and serve Him together. Christ is King Baptist Church meets Sundays at 9:30AM for Sunday School, 10:30AM for worship and on Wednesdays at 7:00PM for Prayer Meeting at 6142 South Salina Street in Syracuse, NY (13205). We are in the plaza which is kitty corner from the OIP Pizza and the new Colonial laundromat. We are a church that is God honoring, Jesus proclaiming, Holy Spirit led, Word-driven for the glory of God amongst the nations. You are welcome to worship Jesus Christ, the King of kings and the Lord of lords with us. He is worthy of our worship. I am married to Kim (20 years) and we have four wonderful kids. We live in Syracuse, NY as of September of this year and are working to start a new Baptist church in The Valley. We love Syracuse and the Orange. My passion is to preach and teach the Word of God, the Bible and to help people come to know Jesus Christ. Our family also enjoys hiking, camping, reading, and working in the yard.